Dill Law Firm | Integrity | Passion | Justice. Words we live by, every day. A COMMITMENT BORN OF EXPERIENCE. Everything we touch on a daily basis has spent time on a truck. But rarely do we think of the men and women who take on the task of delivering these goods – spending three to five weeks on the road, with little time to spend at home with their families. They drive for 11 hours a day – eating and showering in truck stops and sleeping in their trucks on the side of the road. On top of all of that, they are the first to be blamed when an accident occurs – after all, that’s where the money is. At The Dill Firm, we provide top-notch, cost-effective legal advice and litigation, believing that high-billing rates and numerous hours do not automatically add up to courtroom success. In the end, it’s about providing resolution for our clients with the most favorable outcomes. 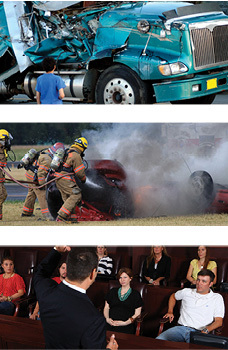 We accomplish this by having a process in place that never leaves anything to chance – a key component that often begins at the scene of an accident. Here, we believe that integrity, passion and justice are not just words, but something to live by, every day.